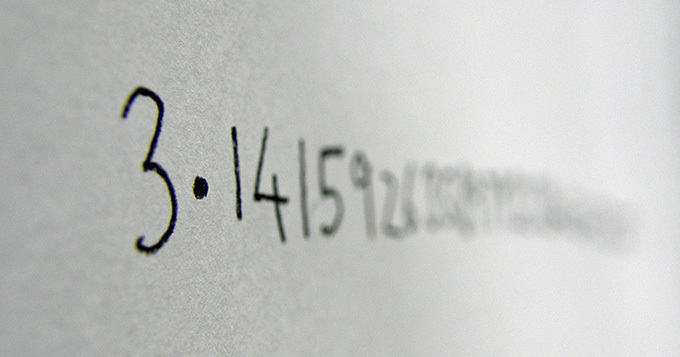 Home > News, Blog & Events > Is today really Pi Day? Is today really Pi Day? How many of us British Mathematicians are celebrating Pi Day today despite the fact we would never write the date as 3/14/16? Go on, hands up! “But we don’t have a choice,” I hear you say. “There is no 31st April, or fourteenth month to give us ‘3/14’”. So what many of us do is that we accept, just for one day, this strange way of writing the date used by our transatlantic cousins. No wonder some of the British population find mathematics confusing! What is Pi Day celebrating anyway? Generations of schoolchildren have learned that pi is the ratio of the circumference of a circle to its diameter. It is an amazing irrational number (which arises in many areas of mathematics) whose decimal expansion begins 3.141592653… and for practical purposes the values 3.14 or 3.1416 are often used. It was used by ancient mathematicians long before the USA was discovered, so why should they have all the fun? There have occasionally been calls to add an extra day to April; last year this was reported in an article in Physics World by Ken Hartley-Wright (Ed. you may want to note the publication date!) which even briefly explored the possibility of adding a couple of extra months to the year. Another solution would be to have the extra day each leap year provides in April instead of February: surely a British Pi Day once every 4 years would be better than nothing? Wouldn’t spring be a much better time for an extra day than nasty cold February? But didn’t the British start it? However those who have studied these things tell me it is not that simple. I wondered if Pi Day was celebrated on 3rd January in 1941, but I suspect that life was too fraught at that time. And anyway, with the difficulties imposed by rationing, it wouldn’t have been easy to bake the now obligatory pies in celebration. What makes the lack of a British Pi Day particularly galling is that we were the first to use the current symbol for pi. Englishman William Oughtred and Welshman William Jones were the first to use it and, thanks to the great mathematician Euler catching on, it became widely used in the eighteenth century. I believe that Pi Approximation Day on 22nd July is our solution. It is not a second class Pi Day, as some seem to think. 22/7 (22 divided by 7), the approximation you probably came across in your schooldays, is 3.142857, so is actually closer to pi than the 3.14 marked by those using the American calendar today. In fact 355/113 (which is 3.141593…) is an even better approximation, but one which poses a lot more problems for those wanting to associate a date with it in our calendar system! Any finitely-expressed value for pi is going to be an approximation and, in my opinion, 22nd July provides a valuable opportunity for conversation with those less conversant with mathematical matters. Regardless of how many digits of pi you can remember (the world record is currently 70,000) or how many digits you have programmed your computer to use, you are always going to be using an approximation. Maths is all about approximations. A-level students often say that what they like about maths is that you get exact solutions, but when they get to university they find that is no longer the case: maths is often about finding the best approximation for a given situation and the real world is seldom exact. So my vote goes for leaving the Americans to celebrate Pi Day in March while the British promote 22nd July as the closest date to pi. Let this be the day we all eat steak and kidney and apple pies; heaven knows the weather in July is not always balmy, but in the unlikely event that it is too hot for pie, there is always quiche!